Some days are just about inspiration. This is going to be one of those days. There are so many good ideas and thoughts and design practices out there that deserve to be shared. So we have put together a roundup of 20 quotes that pertain to design or the creative process or the business itself as a conversation starter. This collection is from all over the world, from a wide range of sources and across various eras. 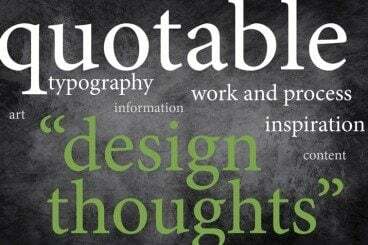 Here are 20 great thoughts about design… and what they can inspire in each of us. Good design starts with the content. A pretty picture does not really mean anything if there is nothing in it; at that point it is just color. Start with an understanding of the content and what you need to accomplish before you begin designing. What a great feeling – “I wish I had thought of that.” Good ideas live on and are made to be stolen. That’s why some of the most classic styles – minimalism, simple typography, classic colors – live on in so many design projects. It is important to note and understand that design is not just the art of being beautiful, but it meets a combination of specific needs. It happens all the time – a client or boss thinks you can design something in a flash. And at some point you will learn to be fast, but that kind of speed takes time. Pettis acknowledges all parts of the process in a simple way. It’s something we sometimes forget. How many times have you gotten excited about a project only to realize a time or technical issue? Remember all the steps in planning so you can account for them in the beginning and avoid disappointment. Creative process is the stuff of inspiration. Go out and do something special to inspire others, just as you are inspired by other art forms. Making something beautiful is the essence of what most designers want to do. While you still have to balance needs of the client or project, you end goal should always be to create something wonderful. Don’t skimp any project … ever. Every designer should try to make this a part of their routine. If you are excited about the work and the process every day, you are less likely to get burned out. The best ideas might not come to you during the 9-to-5. Be ready to work when they do come. It can lead to sometimes crazy or hectic scheduling, but will result in more rewarding work. Keep a sketch pad and pen handy at all times so you can capture the ideas as they come, even if you can’t get to a project right away. Using design tricks and tools is easy, but it can also be a trap. To work within constraints and in a way that is unseen can be pretty tough. Practice making design invisible. Keep working at everything you do. Keep working every project. Keep revising every draft. Don’t worry about the “nos” or “I don’t like that’s” because eventually you will find the answer. It only takes one version that the client likes to be successful. Designers often look at design and say “wow, that is good.” But users of design are much different. They only remember the disasters. When things work or behave or have a look that is consistent with a user’s expectations, they are part of positive or useful interaction. Do you ever get that I-can’t-get-started-because-it’s-not-due-yet feeling? Nothing can motivate a designer like a deadline. If you have trouble getting a project going, set smaller deadlines along the way so that you don’t procrastinate with a major project and get overwhelmed near the end. Sometimes discomfort is the most comforting part of the design. When it comes to typography, consciously decide if lettering needs to be seen, and in what way should users respond to it. Too often typography can be seen as an afterthought. The typefaces you select and styles you use can speak volumes about the rest of the design. Remember that much of your content is likely textual; making every letterform important. Defaults are not for designers. Please, please, please go beyond the default settings in any software you use. Design as a whole is an experience. Remember that you are creating a specific emotional, physical and mental connection for someone with everything you create. Design for how this connection should feel and look. Hopefully you’ve taken a few minutes to feel refreshed and inspired today. Personally, reading words like these can always serve as a great pick-me-up. Are there other timeless words that you find inspiring? Share them with us in the comments.